The Internationales Congress Centrum Berlin (ICC Berlin) ranks among the biggest, most advanced and most successful congress venues in the world. It was built in just four years under the watchful eyes of architects Ralf Schüler and Ursulina Schüler-Witte. Since its opening the highly versatile communication complex - 320 metres long, 80 metres wide and 40 metres high, - ICC Berlin is one of the most outstanding landmarks of postwar German architecture and the model for many new congress centers all over the world. 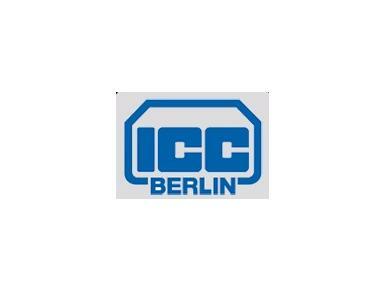 With its 80 halls and rooms seating between 20 and 9,100, its versatile facilities, superb technical installations and comprehensive range of services, ICC Berlin is the perfect choice for any convention, show or concert. The complex is designed and equipped to cater for several events simultaneously. Spacious lobbies (5,500 m2) offer space for exhibitions, poster sessions and company presentations to accompany conventions. This is where the ATM (asynchronous transfer mode) communications system, based on a broadband optical fibre network, proves its worth: it ensures quick, safe and direct access to the Internet and Intranet. The complete building is equipped with Wireless LAN (WiFi) which can be accessed via HotSpots.